TJ Brodie's breakaway goal 1:47 into overtime Tuesday night gave the Calgary Flames a 2-1 victory over the Los Angeles Kings. TJ Brodie's usually the guy making the pass. This time it was his turn to be on the receiving end — and he made no mistake. Brodie's breakaway goal 1:47 into overtime Tuesday night gave Calgary a thrilling 2-1 victory over the Los Angeles Kings. The red-hot Flames are 6-0-1 in their last seven. Sprung free at the opponent's blue line by a 100-foot pass from Mikael Backlund, the defenceman made a nifty deke to his backhand and buried a shot under the cross bar on Ben Bishop. "I knew they had a guy behind [Calgary's] net and another guy at the net, so I figured I'd take off," said Brodie, who was playing career game No. 400. Bishop thought he had him but the shot was perfectly placed. "He came down and pump-faked and I didn't really bite," said the newly acquired goaltender. "I thought I was with him the whole time." 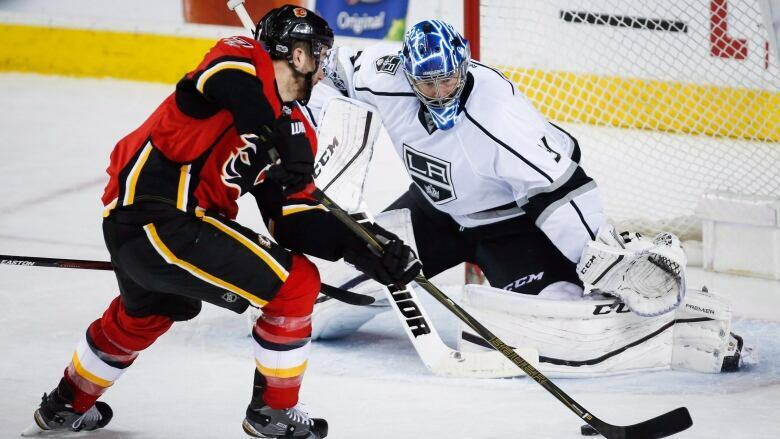 Calgary improves to 7-2 in overtime while toppling the league's best in the Kings. Los Angeles falls to 10-3 in games decided at three-on-three, having also lost that way in Minnesota on Monday. Adding to the drama, the Flames nearly lost the game in the final seconds of regulation when a Jake Muzzin shot deflected sharply off the skate of Mark Giordano, almost slipping past Brian Elliott before Giordano cleared it out of the crease. "The reaction of the crowd made me think to look behind [Elliott], to the side of him because it must have been trickling and sure enough, it was," said the Flames captain. Elliott, who finished with 28 saves, improves to 8-1-1 in his last 10 starts. He's 16-13-3 on the season. Bishop also finished with 28 stops in his first start for the Kings after being acquired from the Tampa Bay Lightning on Sunday. His record falls to 16-12-4. The other goal for Calgary (34-26-4) came from red-hot Micheal Ferland. The Flames climb within two points of the Anaheim Ducks for third place in the Pacific Division. They currently hold the first wild card spot in the Western Conference. Tanner Pearson with his team-leading 21st goal scored for Los Angeles (30-27-6). The Kings kick-off a seven-game homestand Thursday versus the Toronto Maple Leafs. "It was a hard-fought game. Did that last night in Minnesota and got one and came in here tonight and got one," said Kings coach Darryl Sutter. "A little bit of puck luck, that deflection late almost went in behind Elliott but goes out the other side. Overtime we win the faceoff and have a chance. It goes behind the net. Mikael Backlund gets it behind the net and Brodie stretches out and it's a breakaway."